has been extended to January 11, 2017. The format of the paper should follow the IEEE conference paper style. EPEC 2016 will only accept the electronic submission of a full paper in English. EPEC 2016 proceedings will be submitted to IEEE Xplore, EI Compendex and ISI Proceedings. 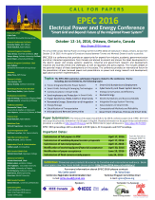 The EPEC 2016 authors are invited to submit extended versions of their presented conference papers for publication in the IEEE Canadian Journal of Electrical and Computer Engineering (CJECE) Special Issue within 4 weeks of the conference final day (i.e. by November 11, 2016). The extended manuscript must be significantly extended (by a minimum of 30%) in its overall technical content and research results beyond the scope of the conference paper published in the EPEC 2016 conference proceedings. The extended manuscript will go through another separate review process according to CJECE review process. For more details, please visit http://journal.ieee.ca/. Based on a number of EPEC 2016 authors’ requests, the deadline for submission of extended versions of the presented EPEC 2016 papers for publication in the IEEE Canadian Journal of Electrical and Computer Engineering (CJECE) Special Issue has been extended to January 11, 2017. For submission, please use the instructions posted on below and http://journal.ieee.ca/authors.html. The submission of extended papers should be done directly to the CJECE journal after which they will go through a separate review process. Additional information can be found at http://journal.ieee.ca/aboutcjece.html, under Authors. A signed IEEE Copyright Form. In your cover letter, you should state that your submission is an extended paper of the EPEC 2016 conference paper under title ” … ” by the authors … (list of authors), that you are the corresponding author (provide your contact info), that you (and/or your co-author(s), please provide the names(s)) presented the conference version of the paper at EPEC 2016, that your extended paper is not published or submitted anywhere else, and that it has over 30% of new material as outlined in more detail in your accompanying “Extensions Beyond Proceedings” document.